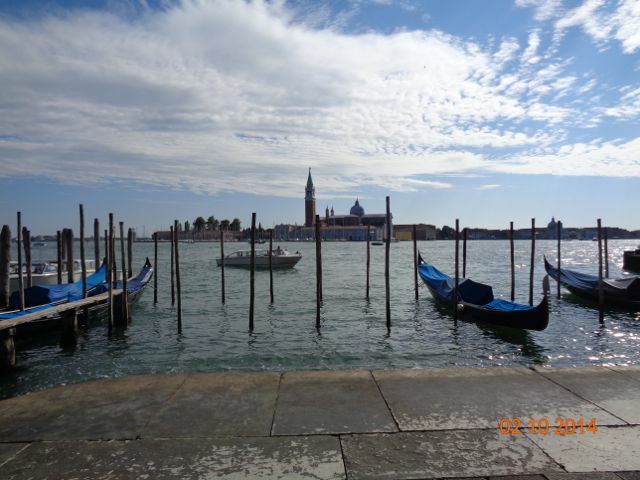 I really didn’t think I’d like Venice as much as I did. I’m not a water or boat person, but the charm of this city is impossible to resist. It started life as a group of about 118 islands that were close together. As people fled the wars on the mainland (barbarians, Visigoths, Genghis Khan, etc.) each new group settled a new island. 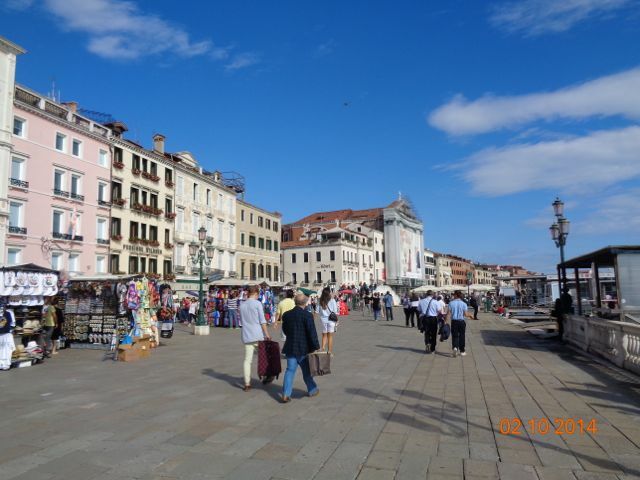 The first thing they built was a church and the town square–called a campo which was really a field in the middle of their houses where the livestock hung out and the dead were buried. Eventually, they started building bridges to hook the islands together, and finally, they built so many buildings on the islands, they began to look like buildings rising out of the water, rather than buildings sitting on small islands. So, that’s how the canal system developed; they were just the natural waterways between the little islands. In the last 200 years, many have been filled in and more walkways were created. Today, you can walk from island to island over the more than 400 bridges and on the walkways that surround the city. 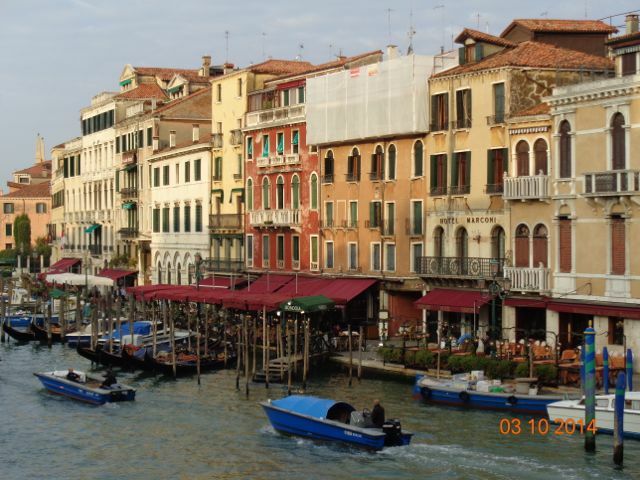 I should also note that Venice is very different now than it was even several decades ago. It is very expensive to live here so its population is decreasing. It’s gone from about 200,000 in the middle of the last century to about 58,000 today. Every day 40,000 additional people commute to the city for work. 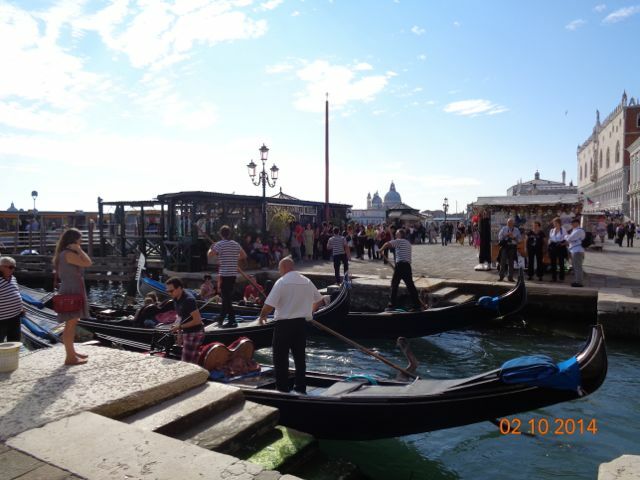 Each year they welcome 25 million visitors. 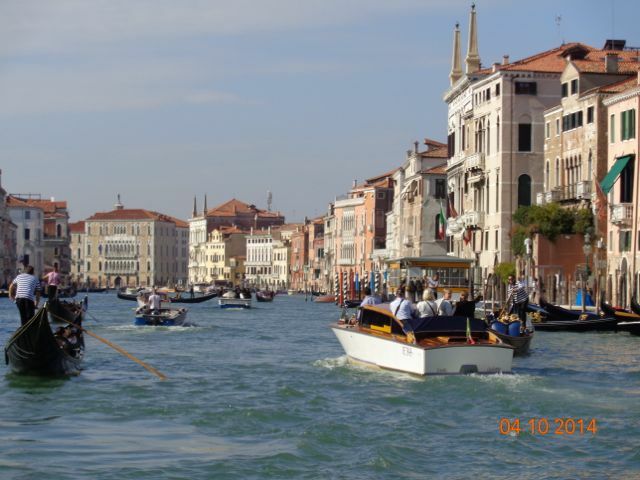 The city is completely dependent on tourism; there is no longer any industry or other business in the city. It’s all tourism. 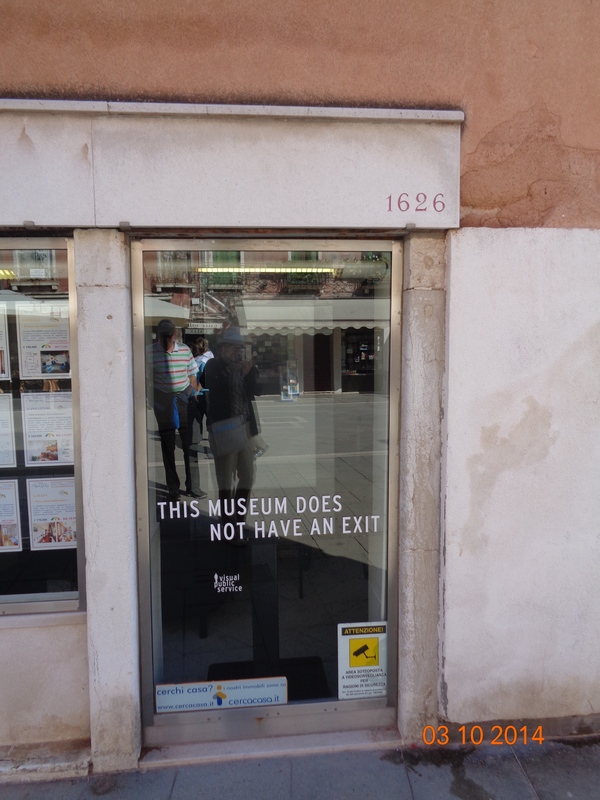 One of the tour guides referred to it as a city-museum, and that about what it is. 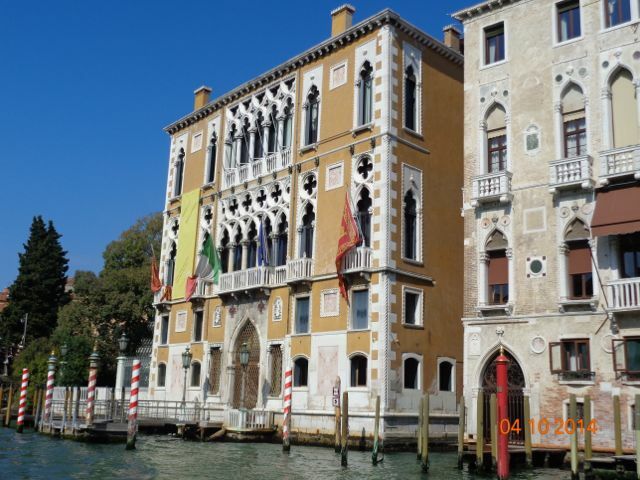 Some of the large buildings along the Grand Canal are empty and they are only maintained for appearances. It’s kind of sad, really. 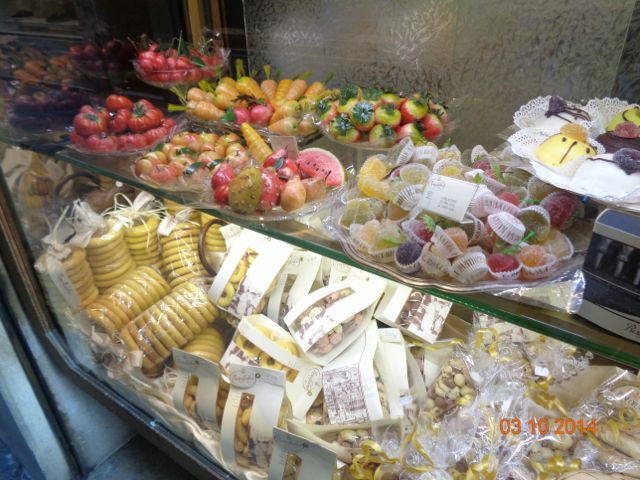 Even the glass making on Murano and the lace making on Burano are dying art forms. Okay, enough of that. 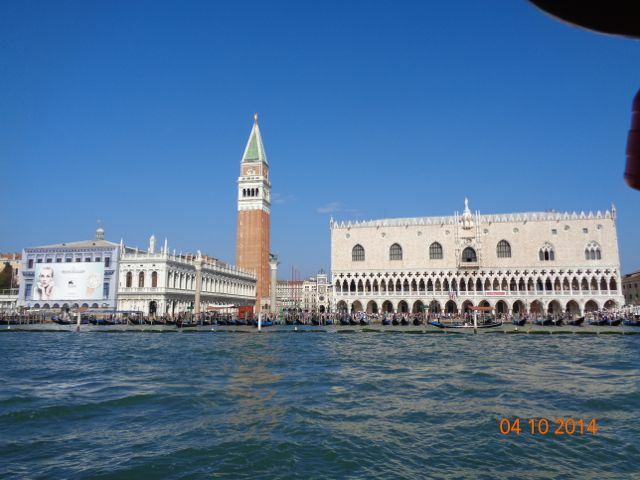 What exists in Venice is spectacular and shouldn’t be missed. Everyone should come here at least once in their lifetime, it is just so interesting. 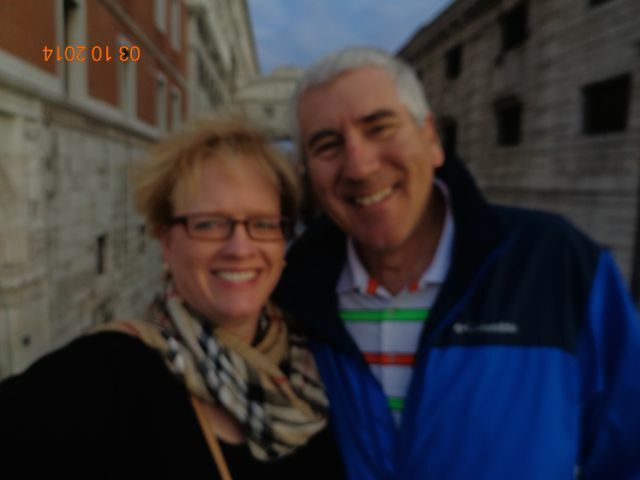 We arrived at the train station, which is at the end of a 4 mile long bridge that connects Venice with the mainland. 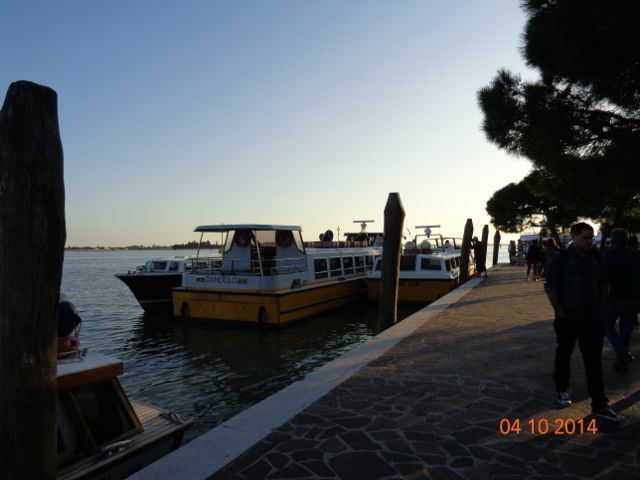 From there, we took a water taxi to our hotel. 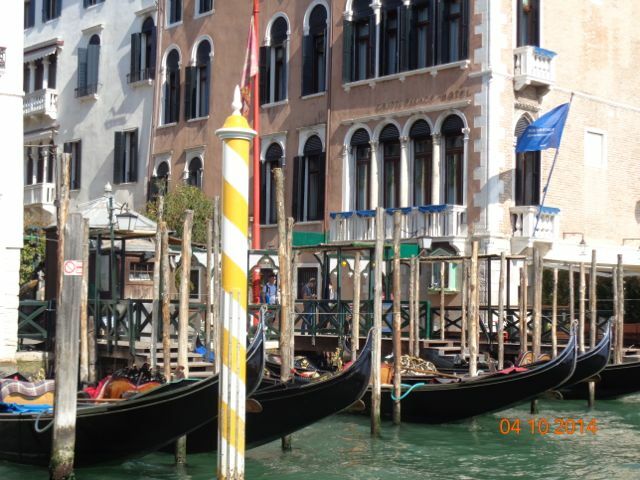 It required a trip along the entire length of the Grand Canal and it blew me away. 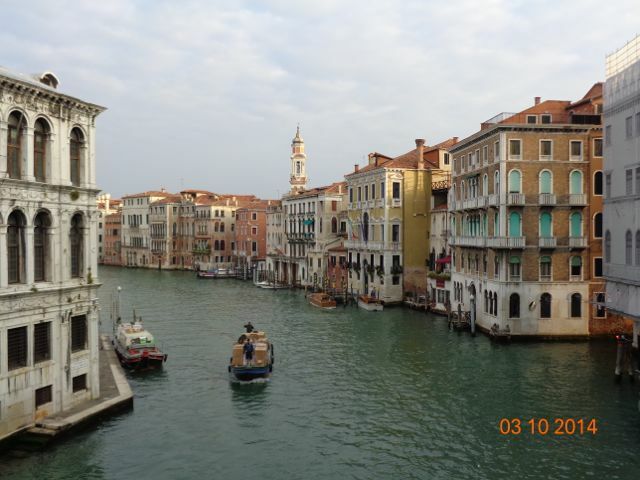 Here area couple of pictures I took of the Grand Canal from the Rialto Bridge. It was just amazing. This is the view out the front door of our hotel. 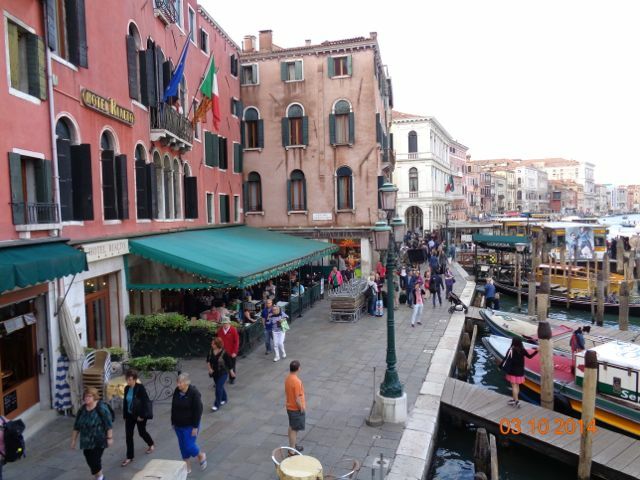 This area along the Canal has the widest sidewalks in front. In some places, they’re only a couple feet wide! 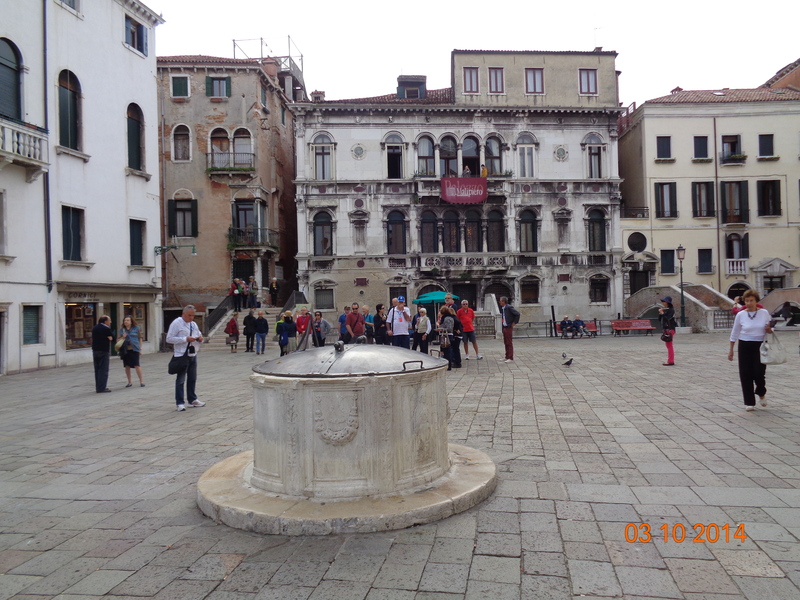 Some of the scenes between the hotel and St. Mark’s Square. And here we go! 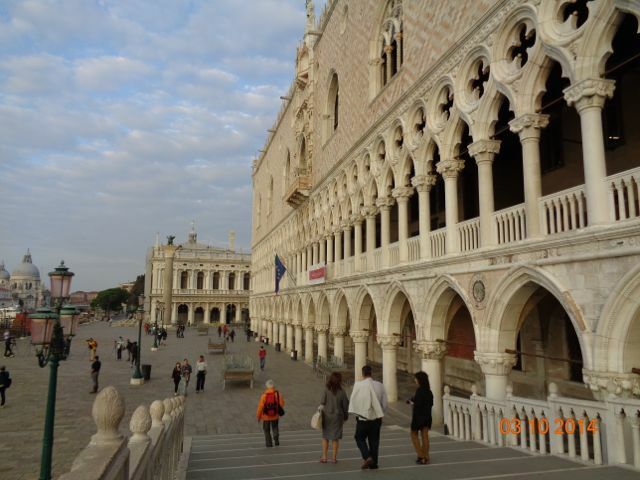 St. Mark’s Square was only a couple minute walk from the hotel. Our first visit was the afternoon we arrived and it was mobbed with people. 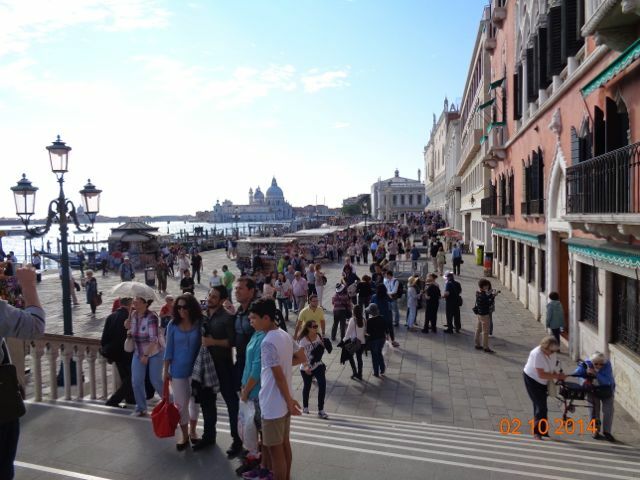 There are cruise ships dropping off thousands of people every day and that day, I swear they were all at St. Mark’s! 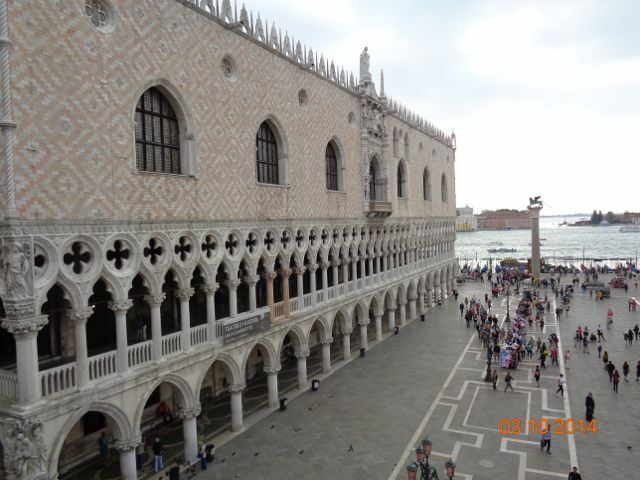 This is the view of the Doge’s Palace from the bridge in front. We got up early the first full day to walk to the meeting point for our tour. 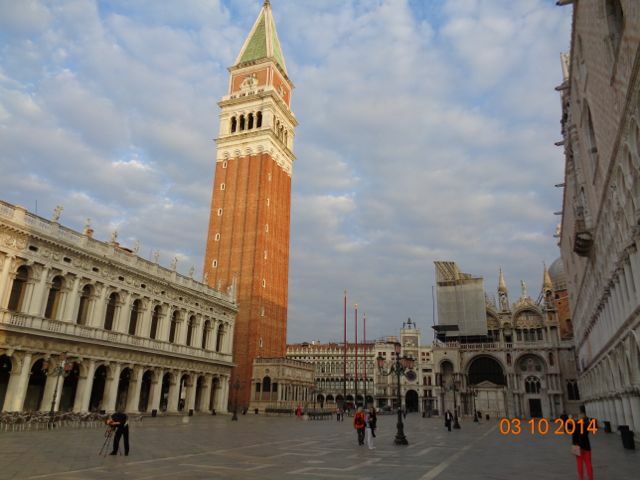 We discovered St. Mark’s Square is deserted in the morning. Some of the things we saw along the way. 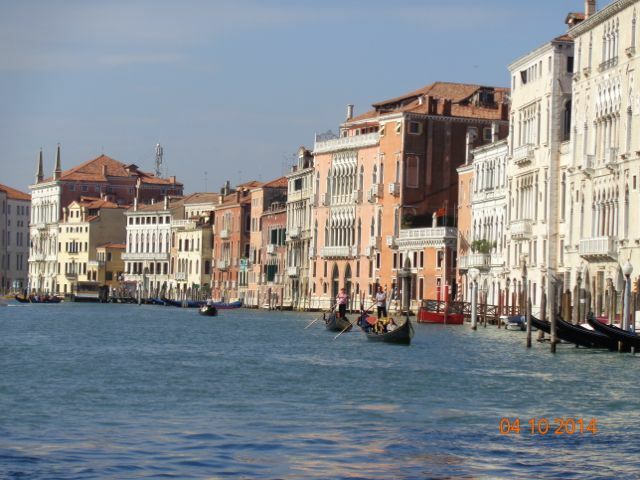 The Grand Canal is the main waterway throughout he city, but it is also riddled with little (and I mean tiny! I don’t know how boats pass each other in some of them!). 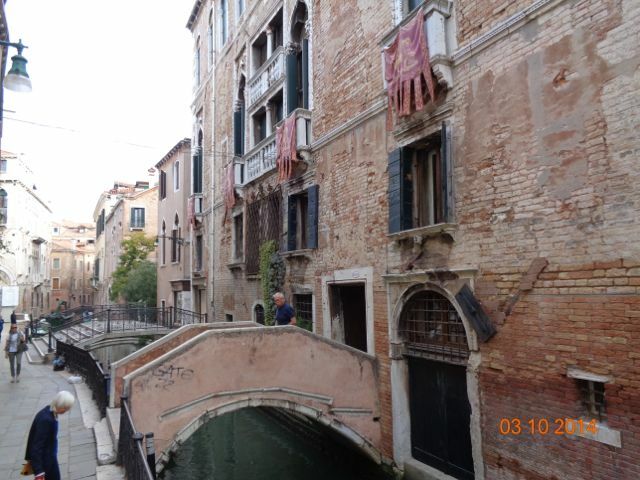 In between he canals are hamster trail-like walkways. They twist and turn and it is impossible not to get lost. 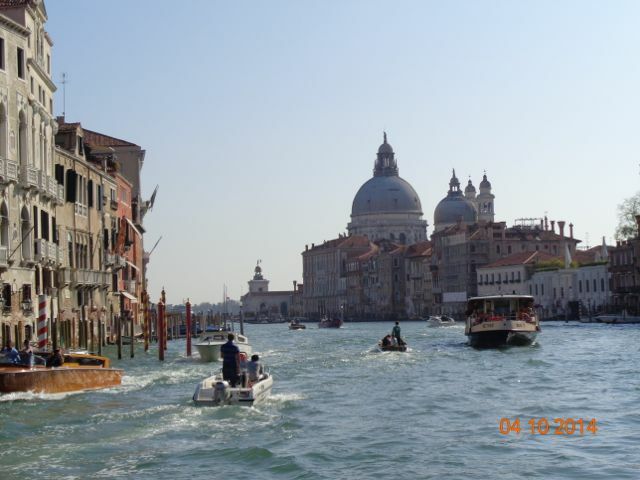 The guide book says there really isn’t an accurate map of Venice that’s economical enough for tourists. Just go with the flow! 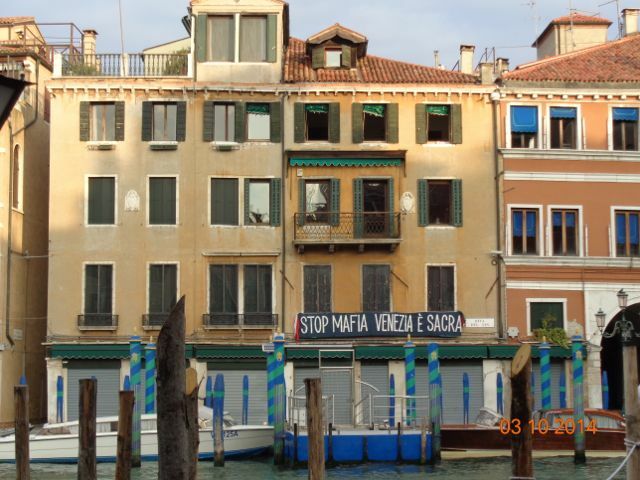 Also, I thought the “stop mafia” sign was interesting. 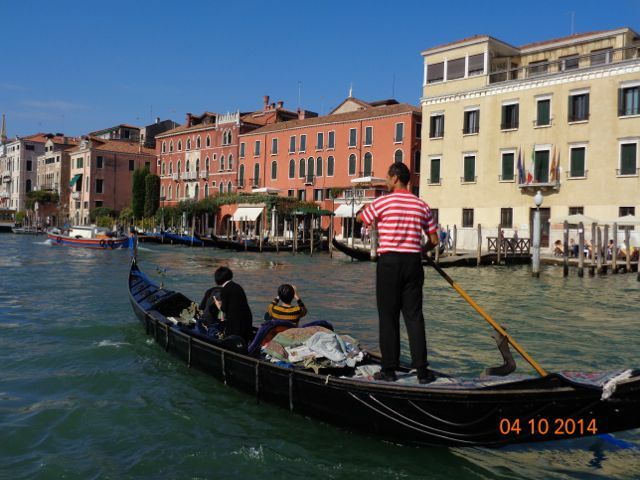 We found our way back to the Grand Canal. 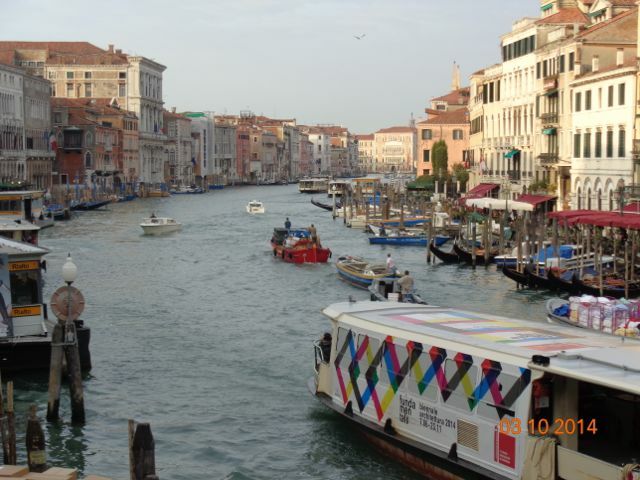 The colorful boat in the foreground is a vaporatto–aka: a water bus. While we were standing here, a boat docked that was loaded with boxes of vegetables. We watched as the guy on the boat literally threw boxes of tomatoes and lettuce to the guy on the dock without losing even one in the water. 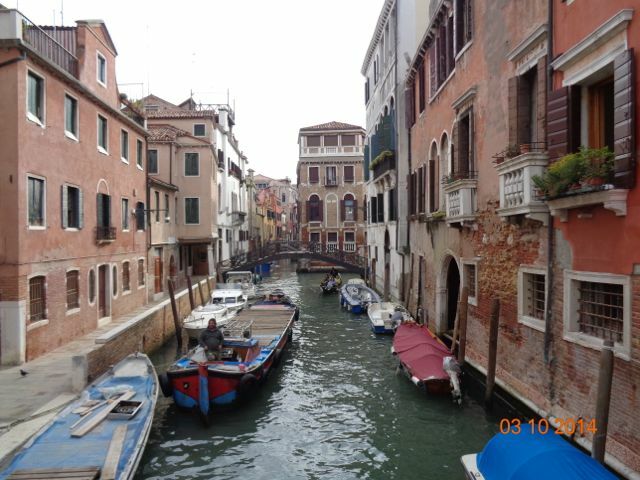 One of the side canals. This one is pretty good sized. 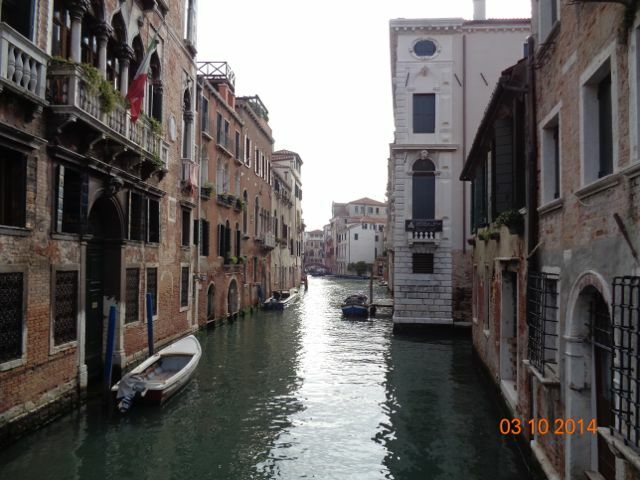 Here are more of the smaller canals. They vary greatly in size because they were as big as the space between islands. 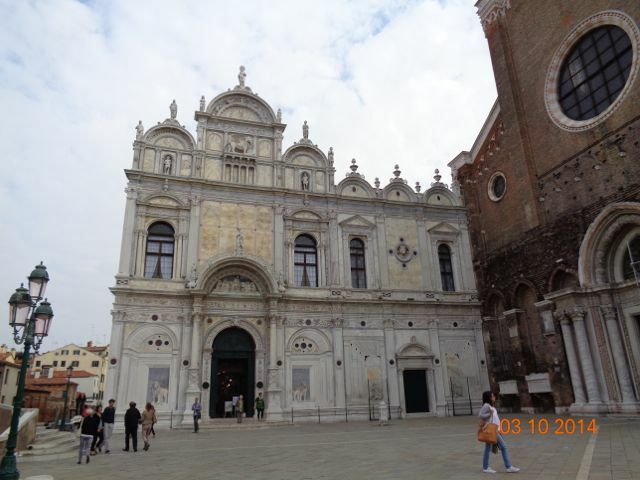 This building was finished in the 14th or 15th century and today it is the hospital. With all the parked boats, I don’t know how another one can pass through. Here’s a picture showing how the buildings were made. Wood pilings were driven into the bedrock very close together. In the absence of oxygen, they didn’t rot. Instead, they petrified and became a very strong foundation. 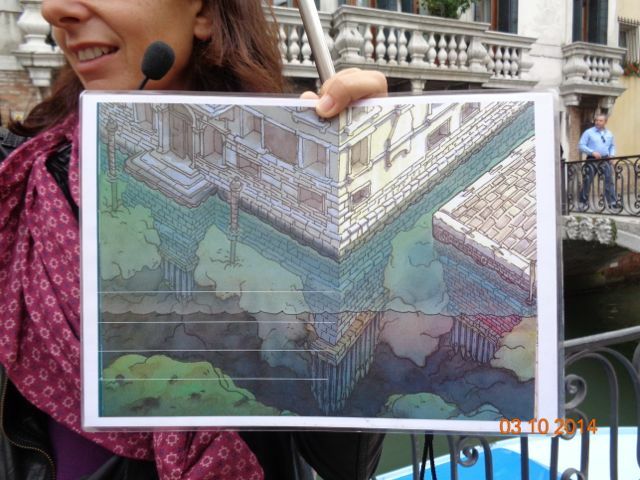 On top of the pilings are various waterproof layers and the building sits on top of all that. I was surprised that they don’t need to be replaced regularly. They are pretty permanent. 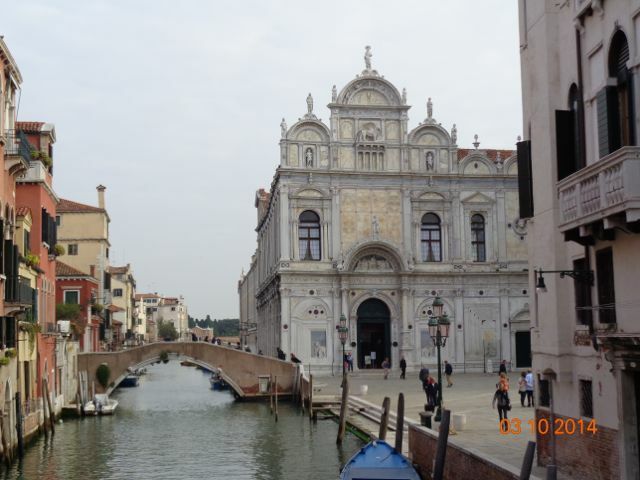 The covered bridge in the distance is the Bridge of Sighs, the bridge that lead from the Doge’s Palace (where a prisoner was sentenced) to the prison. 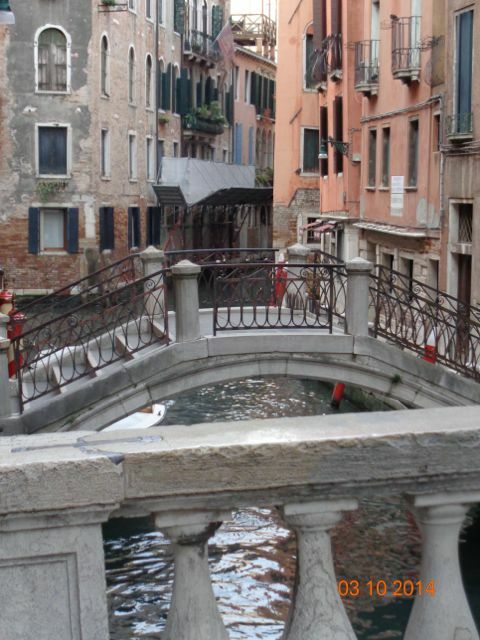 The bridge gave the condemned their last view of the Venice, thus the nickname, The Bridge of Sighs. 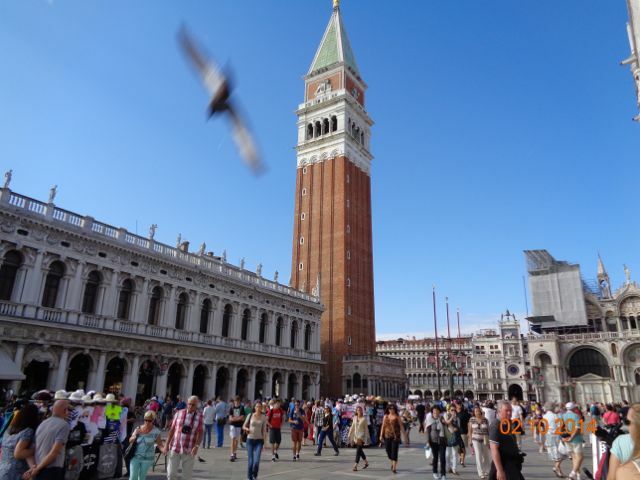 St. Mark’s Square is one of the lowest spots in Venice so it often floods. Of course, the tides rise and fall daily, but they sometimes overtake the city. 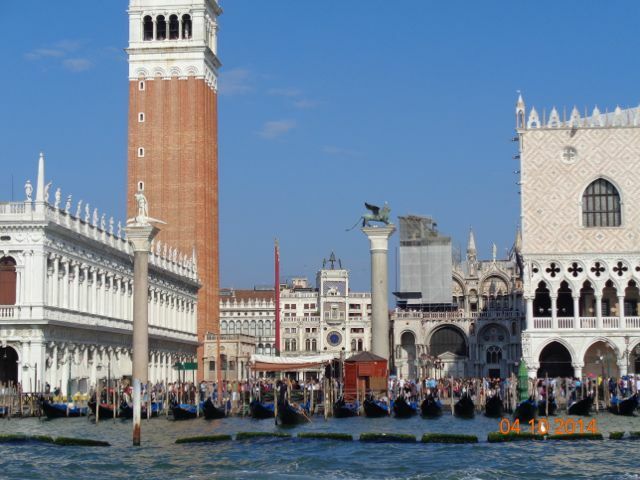 As many as 50 times a year Venice floods. When this happens, they put these low tables down to make raised walkways for people to pass. The locals often just wear knee (and sometimes hip) boots when it floods. The floods usually happen in winter. 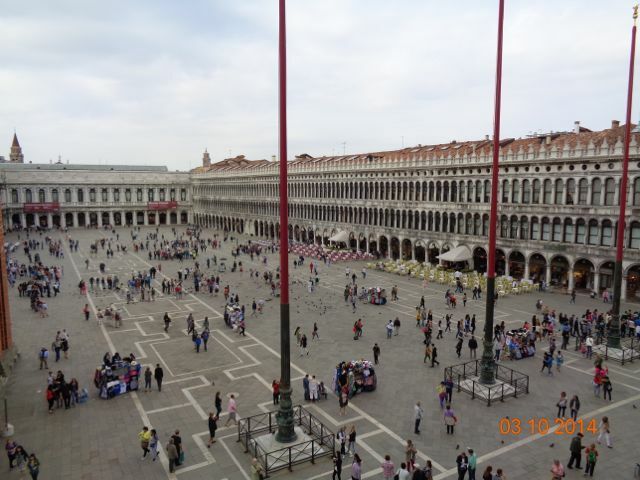 We climbed to the balcony of the church to get a good view of St. Mark’s Square. The crowds were much better today. 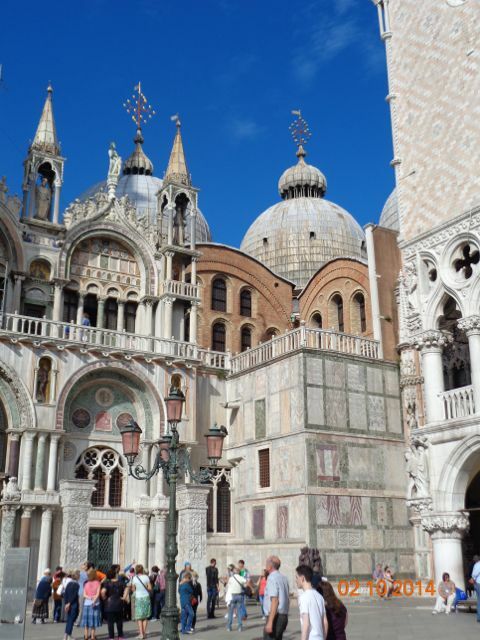 These are all views of St. Mark’s Square and the Doge’s Palace. 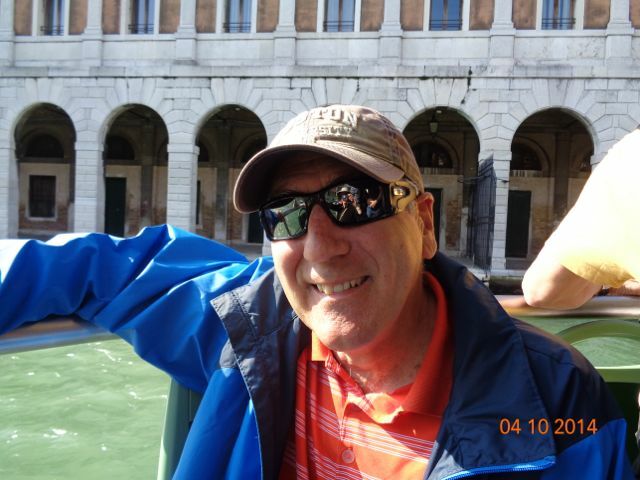 I didn’t realize that Venice is one of the longest lasting Republics in history. For hundreds of years (much longer than the US!) 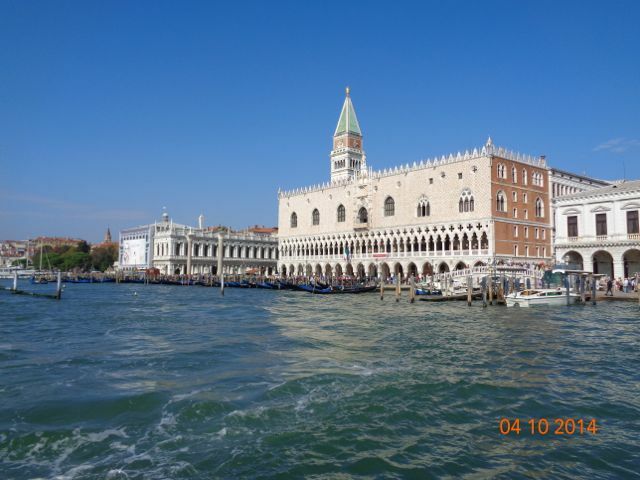 Venice was governed by a “congress” of about 2000 noblemen who elected the Doge (i.e. president) from among them. They had incredible checks and balances in place at all levels of the government and it seems to have worked really well for them. 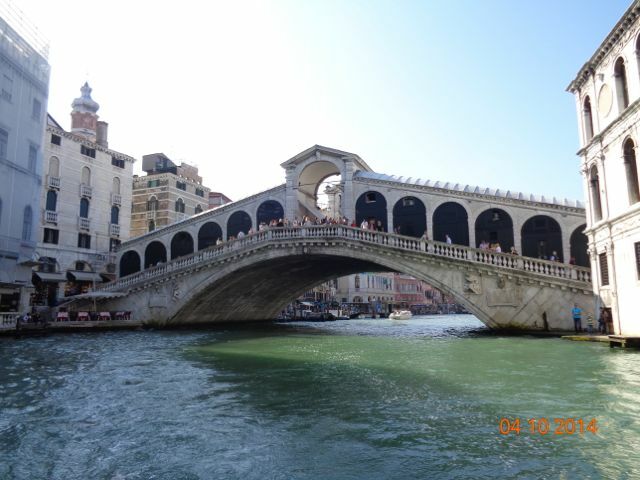 This is the Rialto Bridge, one of the four bridges that cross the Grand Canal. 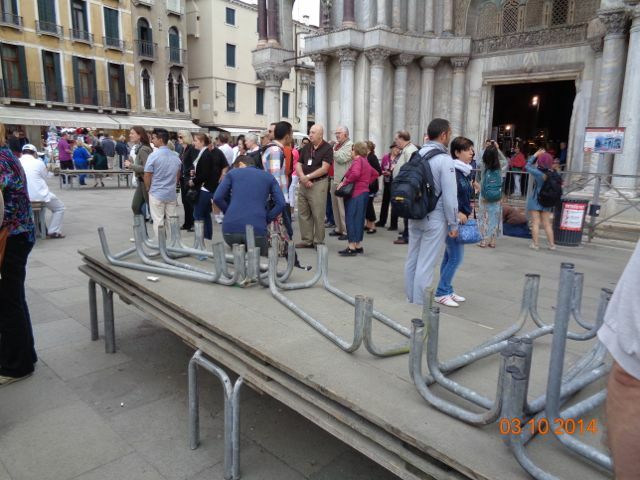 Did I mention that nothing with wheels is allowed in Venice? The only exceptions are dolly’s (to move boxes) and a few kid’s toys, roller skates. 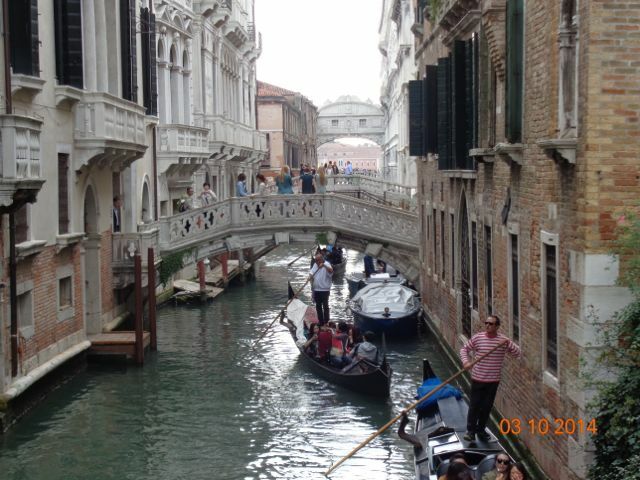 Here you can see how narrow some of the side canals can be. 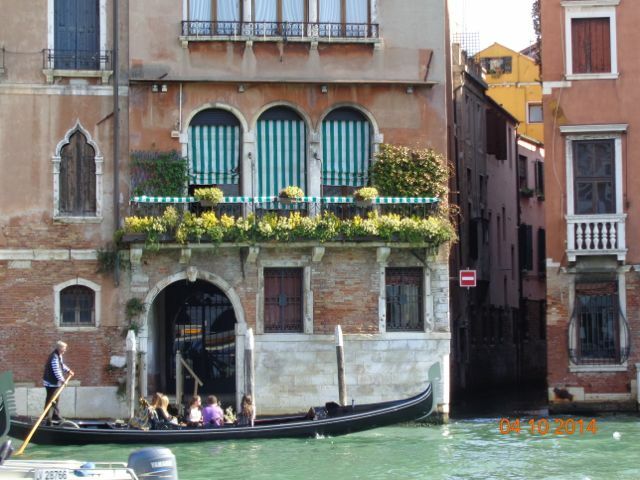 As I said, I don’t know how boats, even skinny ones like the gondolas, could pass each other in such a narrow canal. I do have to tell you about the cheeky pigeon. We sat in the courtyard outside and we were surrounded by college-aged kids from all over the world. At one point, a pigeon jumped onto the table next to me and the guy there shoo’ed it away very aggressively. I think he startled it because it flew straight sideways into an Asian girl who shrieked and caused quite a seen. I was still chuckling when the pigeon jumped onto our table and grabbed a fry. 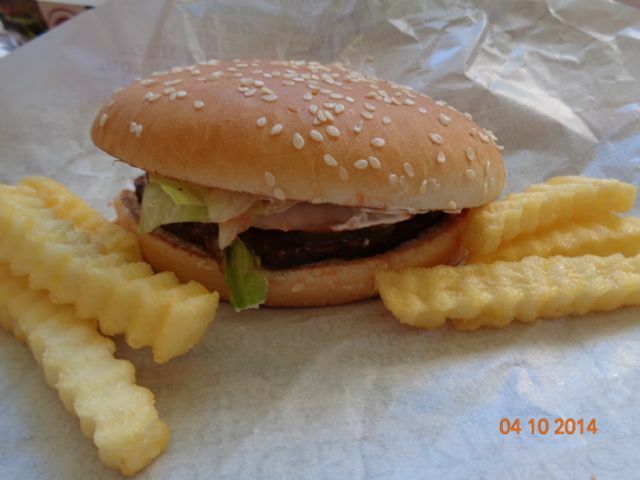 It just stood there looking at me with that fry in its beak. I didn’t want it to assault the poor Asian girl again, so I shoo’ed it gently but it just stood there mocking me. So I swatted at it thinking it would jump out of the way. It didn’t! Instead, I smacked it in the chest and pushed it off the table and onto the floor! I don’t think it cared at all, it was busy eating my fry. 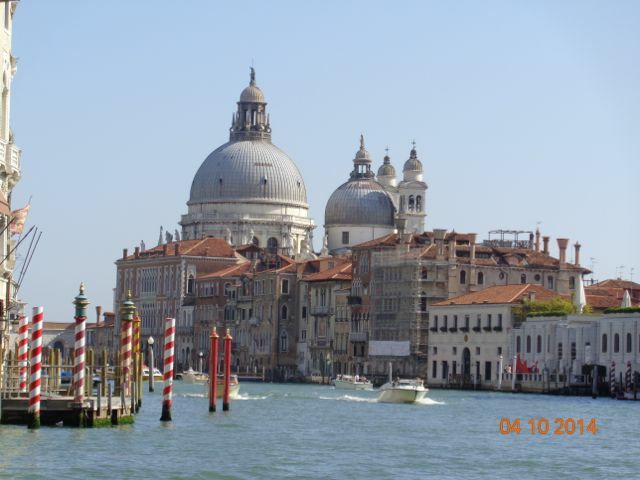 More of the views from the Grand Canal. I think this is one of my favorite pictures. 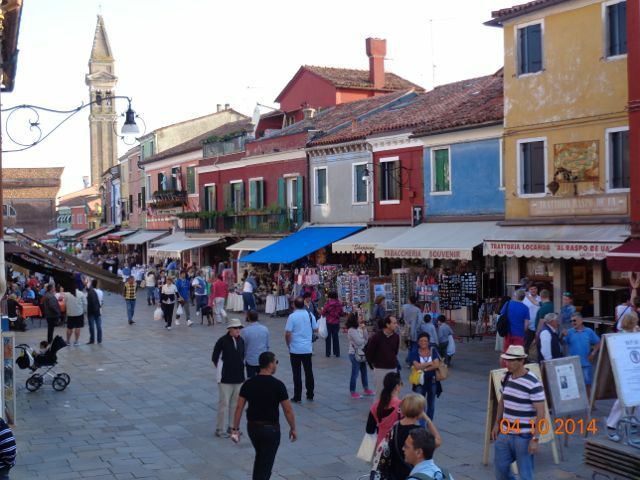 We also took a tour of the islands of Murano and Burano. 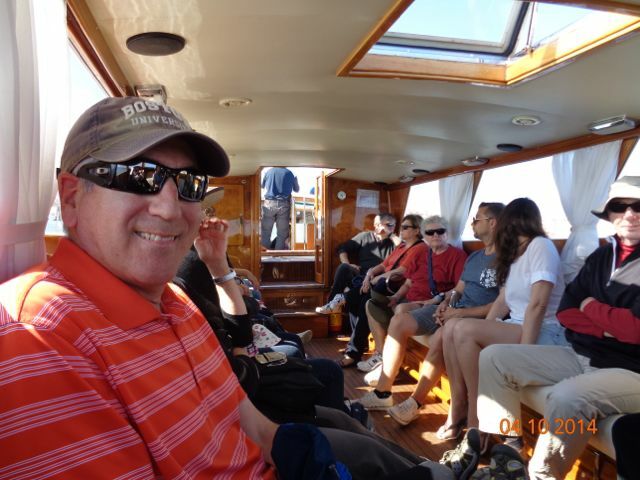 Here’s Bob on the boat out to the islands. 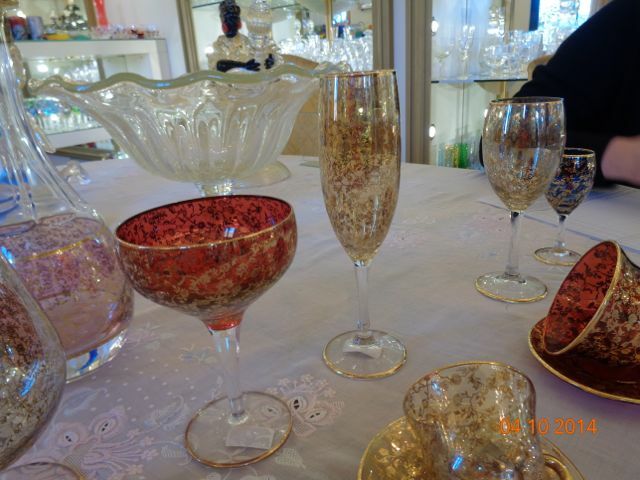 The Murano glass is really beautiful. In the past, the different techniques were passed from father to son, but they are slowly dying out. 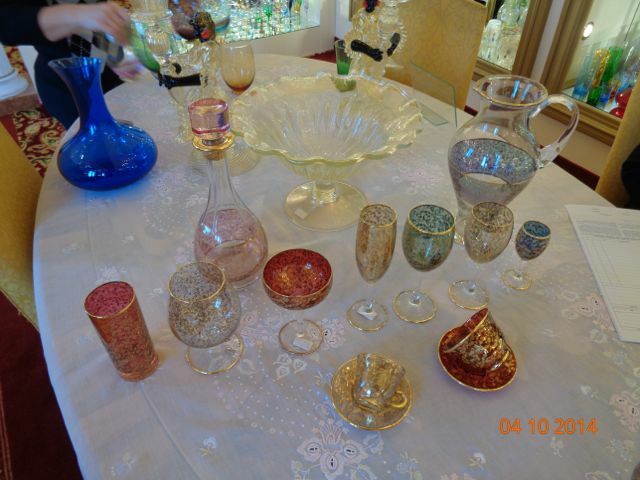 Only a fraction of the glass workshops from the past are still open. 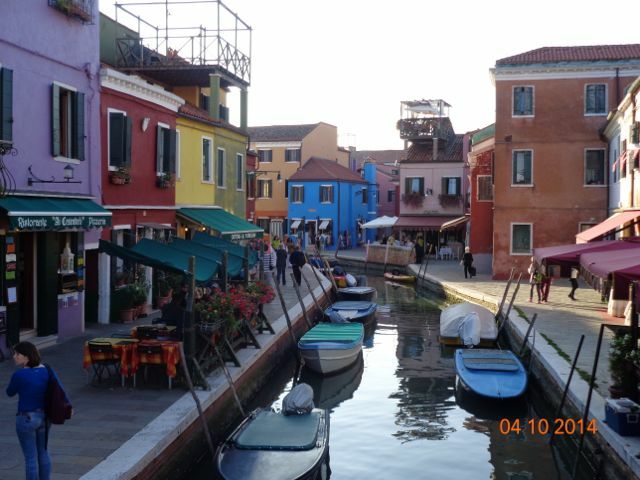 This is Burano which is known for its lace. Again, the art of making lace is dying out because it can be made by machine so much faster. It takes forever to make it by hand and I was staggered at the prices. A small piece, about 8 inches in diameter, that was suitable for framing, took 7 people 7 months to finish. They were charging 800 Euro which is roughly $1000. This reminded me of growing up in South Dakota. 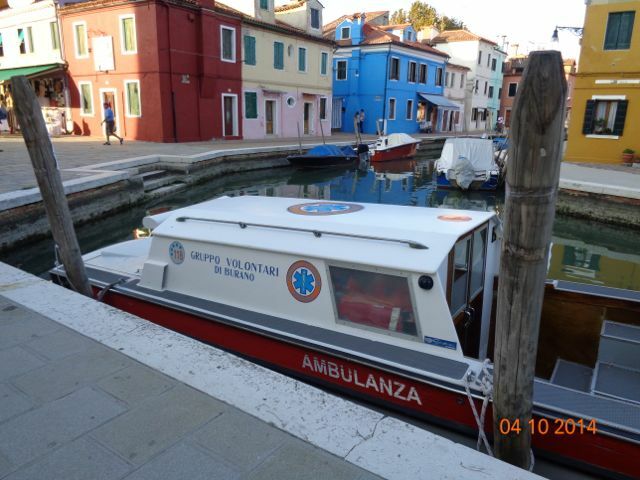 It’s the volunteer ambulance, only it’s a boat. This isn’t a great picture, but it shows something I found fascinating. When there aren’t enough spots for all the boats to dock, the boats line up and hook themselves together. To get on and off the furthest boat, you have to walk through all of them. It was all new to me. 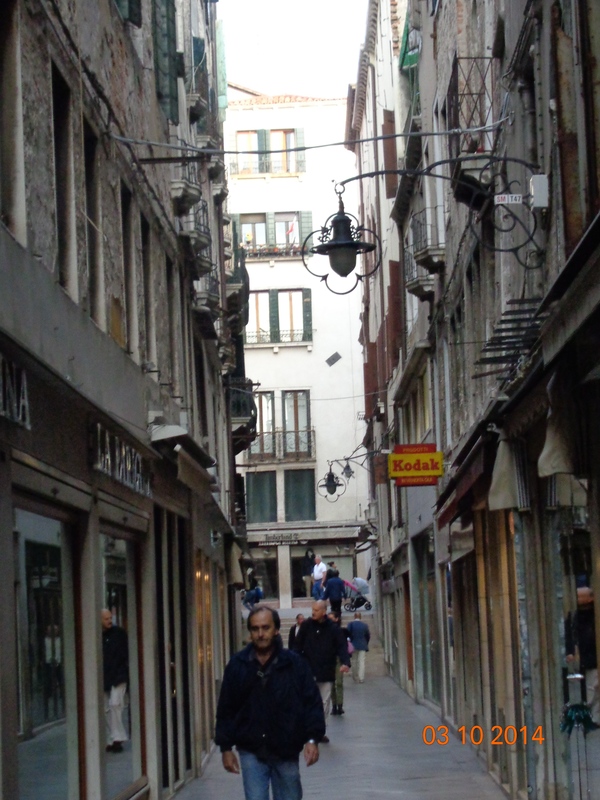 I can’t believe I didn’t take more pictures of the little alleys. This is a large one. Some of them require you to turn sideways when someone passes going the opposite direction. This is one of the campos — or little fields. There’s one on each island, or at least there used to be. Some have been replaced with buildings. There’s a cistern under each one that caught rain water and this is the well where people could draw fresh water out. 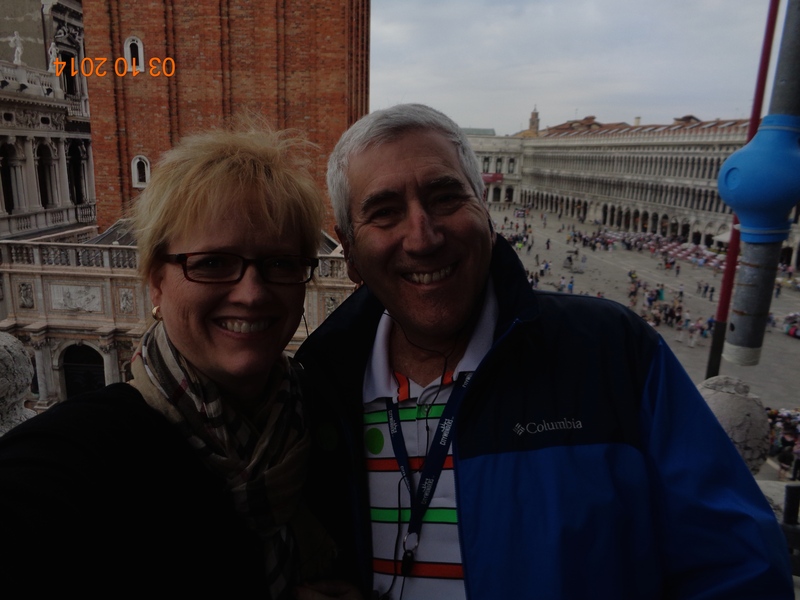 Here we are on the observation deck of the church on St. Mark’s Square. It was a spectacular church, but no pictures were allowed. The most amazing thing there were the life sized (or maybe slightly larger than life sized) bronze statues of four horses. Scholars debate their age, some say 200 B.C, some say 200 A.D. In either case, the statues are about 2000 years old. They were incredibly beautiful and the details were perfect. 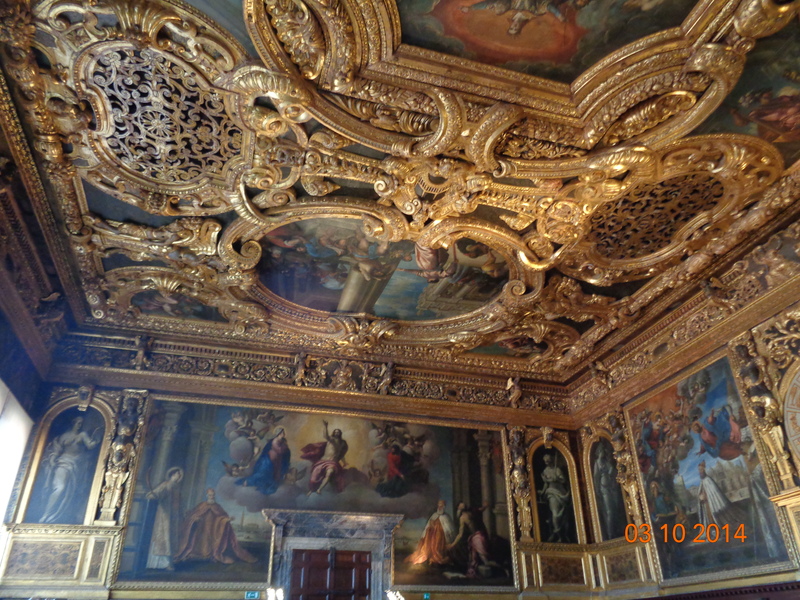 This is inside the Doge’s Palace. It’s a very large building that was the seat of the government, as well as the home of the doge. When a new doge was elected, he and his family were obligated to live here, sort of like the President and the White House. 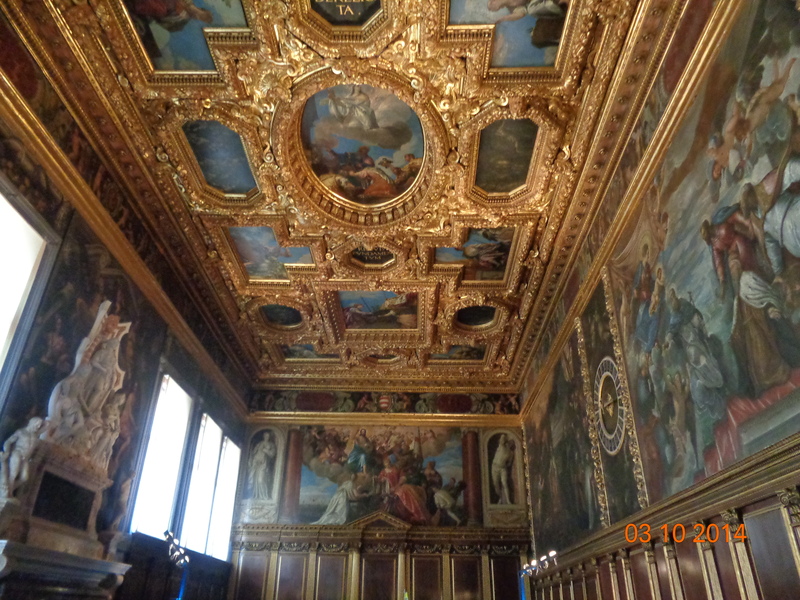 It had some breath-taking rooms. In some cases, the frames are more incredible than the paintings. 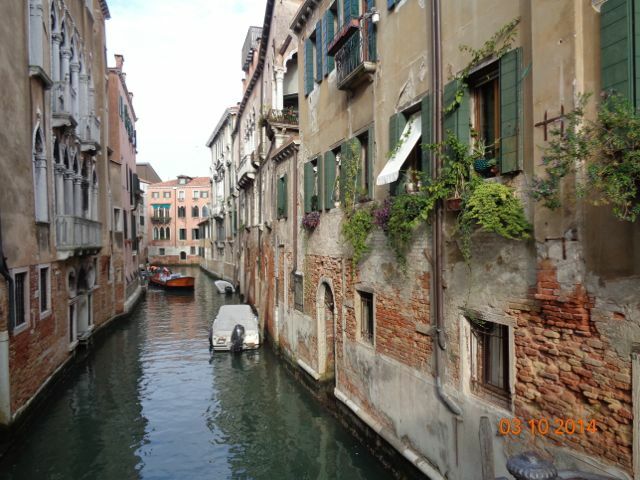 Since this is Venice, frescoes deteriorated within a few years. So, they either had to make everything out of mosaics, or they had to paint it on canvas. In these pictures, all the paintings are done with oils on canvas. Now this is an interesting room. 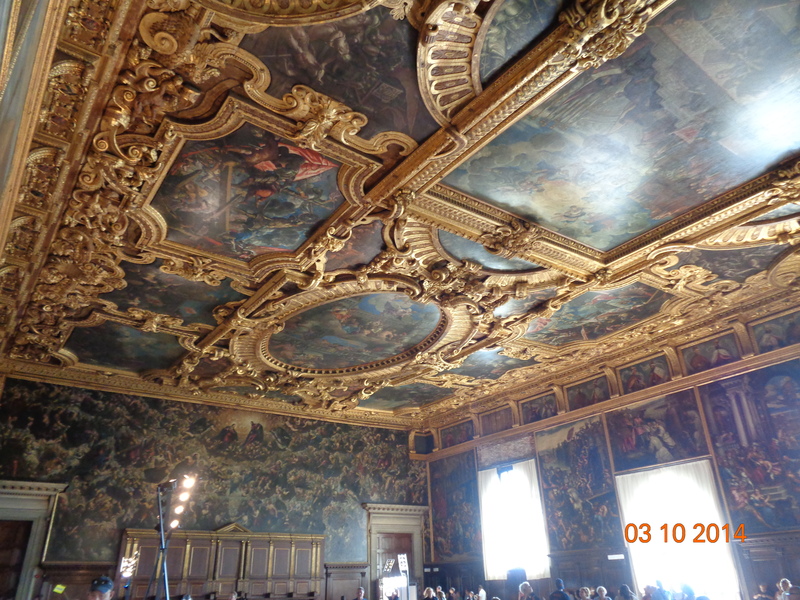 It’s where the 2000 noblemen met and it’s the largest room in the world that doesn’t have columns to support it. It’s about the size of half a standard soccer field and it was built in the 1500s. Also, the painting on the far wall is the largest canvas painting in the world. It’s about 25 meters wide. Forget the hotel, this is the Museum California. At least they warned you before you got stuck inside! 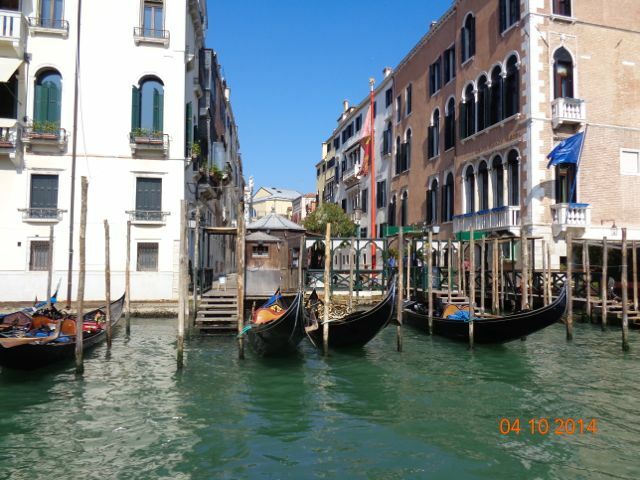 Finally, I took many videos going up and down the Grand Canal and I put one of them on Youtube. It’s only a minute or so and it ends with my favorite view on the Canal. Enjoy!